Over the past eight years, interviewing candidates for senior positions with major corporations and the federal government, I’ve been struck by how many candidates who look great on paper come unstuck at interview. Often, very intelligent people can make basic mistakes. Some have obviously made no preparation and appear disorganised. Others assume their record or qualifications will speak for them, or, not wanting to appear conceited, do little to sell themselves. A candidate who prepares well and presents well will always win out over candidates with similar credentials and experience. To help you ace your next job interview, I’ve turned the interview process inside out with a list of 30 ‘must do’s’ that will help you woo and win interviewers like myself. 1. Confirm the time and location of the interview the day before the interview. Sometimes things can be written down wrong, and sometimes the interview panel gets their details wrong as well. If you turn up late or miss your interview totally, you might not get another chance. Plus, it shows that you are detail oriented, organised and proactive. 2. Review the research that you've already done on the department or agency, and if you haven't done any yet, get cracking! Before you step foot in the interview room should know what the organisation does and who for, as well as where the position fits into the overall organisation. If you're leaving it for the interview to ask these types of questions, you've left it too late. 3. Regardless of the dress code in the department / agency you are applying to, you should wear and suit (and tie if you are male) to the interview. It's hard to be over-dressed for an interview, but easy to be under-dressed and create a bad impression. 4. You should aim to be at least 15 minutes early to your interview. Show the interview panel that you are punctual and keen! 5. If you're using public transport to get to your interview, allow extra time for delays or wrong stops. If you're driving, give yourself extra time to find a carpark, and make sure you have plenty of spare change for parking meters. Top up your meter with double the time you think you'll need (there's nothing worse than sitting in an interview that is running overtime, stressing about getting a parking ticket). 6. If you are late, stay calm and apologise with a valid reason, but don't make excuses for poor form. 7. If you're told the interview will take half an hour, allow a full hour. If you're told it will take an hour, allow two. Interviews often run late or overtime and while you're not allowed to be late for your interview, the selection panel think they're allowed to do what they want! Getting up and leaving the interview early because you have another appointment or need to get back to work will not look good at all, even if it's the selection panel's fault that the interview is running over. 8. Leave your mobile behind. Or if you need to take it with you, switch it off (not just to silent). No distractions please! 10. Even though you're selling yourself in an interview, don't over do it. Be yourself and let your true personality, skills and experience shine. 11. A great way to form rapport with the interviewers is to smile. Smile and be friendly throughout the interview even if you're nervous and don't think it's going too well. 12. Facing an interview panel can be difficult, and knowing how to make eye contact with and when can be confusing. Consequently, a lot of applicants end up looking at the table, their hands or into their lap. The best way to go about it is to make eye contact with the person who asked you the question. Don't feel the need to dart around and look at everyone, just concentrate on one person at a time. You might also find that you spend a bit of time looking at the tops of people's heads as government selection panels tend to take a lot of notes. In this case, just be ready to make eye contact when they lift their head. 13. One word answers are a no-no. One of the biggest mistakes to make at an interview is not giving enough information, in my experience. Although a lot of government interviewers will prompt applicants to say more or answer in a different way, this doesn't always happen. As a rule of thumb, introduce what you are about to say, and then expand. You can always wrap up your answer with "is that enough information or would you like me to give more examples?" 14. Contradictory to the last point, it is also important to be somewhat concise. I say this because I have been in interviews where an applicant has spent half an hour answering one question. That's definitely not necessary. Lots of words does not equal lots of quality information. Often, the applicants who have lots to say often don't answer the interview question. They just ramble! So, say what you need to say and keep it succinct. 15. There is not much more off-putting to a selection panel than a negative applicant. By that I mean an applicant who has negative things to say about previous jobs, companies, bosses, colleagues or work. Making negative comments about others does not make you look better, so stay positive. 16. If you are incredibly unlucky, you might find that your interviewer says some things that you know are factually incorrect. Now is not the time to tell them they're wrong or correct them (unless they are talking about your experience or qualifications). I have been in more than one interview where this has happened and an argument has taken place between interviewer and applicant (not myself I must add!). This is definitely not the way to impress and land a job, but a great way offend egos and get your application put at the bottom of the pile. 17. Hands up if you've been tempted to exaggerate or stretch the truth in an interview? It can be tempting, but if you're caught out it will ruin all chances with this employer and if you already work for the government you could face disciplinary action. Stick to the truth, always. 18. An applicant who uses the word "we" a lot in an interview rings alarm bells for an interviewer. It gives the impression that you don't or can't work alone and raises the question of what you have actually done in the past (was it you or was it someone else?) Use the word "I" whenever possible. 19. Anyone can say they have a particular skill, ability or experience. But it is so much better if you give an example of it in action. Just like in your written application, actual examples are gold dust. So, for example, don't just say that you have good written communication skills, give an example of how you communicate in writing in the work place and WHY your skills are good. You can even take a physical example with you into the interview if you like. 20. If you're not sure what an interview question means or what the selection panel is asking, get clarification from the selection panel. It's better to ask and clarify than give an answer or talk about something irrelevant. 21. If, for some reason, you were not able to find out a lot about the job before your interview, find out as much as you can early during the interview. That way you can frame your answers to the needs of the job. If you did find out about the job before you turned up for the interview, perfect, you're all set to make the perfect match between your skills and what's needed in the job. 22. Take a copy of your application and the job specification (or job description or selection criteria) to the interview with you and ask if you can put it on the table in front of you. If you know what selection criteria the interview question is relating to you will be better equipped to answer it. Also, you can refer the selection panel back to your application. For example, "in my written application on page X I gave an example of abc, I'd like to take that a step further and tell you about xyz..."
23. Try as hard as possible to stick to the topic and don't get off track. Remind yourself of the interview question, pause, think, clarify and respond. 24. If you allow the interviewer to set the tone of the interview and then reflect their communication style, you will improve your chances of making a favourable impression. 25. I mentioned above the pause, think, clarify, respond formula. Pausing and thinking before answering a question will avoid the 'ummms' and 'ahhhs' that can infiltrate the interview. If you have been given some water, listen to the question, have a sip and then go for it. 27. Most of the time the interview ends with the panel asking you, "do you have any questions?" The answer is always yes! Everyone wants to see an applicant that is well prepared and excited about the position they are interviewing for. But, there a few rules on what kind of questions you should ask. Never ask a question about something you should already know. This will have the opposite effect; it will make you look unprepared and uninterested in the job. Things you should already know include the general duties of the position and general information about the department or agency you are applying to. Don't ask any personal questions about the interview panel. Any question about conditions of service, unless it is raised by the selection panel first. See below. 28. You might think that the interview is so the panel can find out more about you and you can find out more about the job, but really, it's all about you and your suitability. What you want shouldn't even enter the interview room or conversation. The whole interview should be focussed on what the employer wants, not what you want or can get out of the job. Sound unfair? That's how interviews roll. If you want to know more about conditions of service including pay rates, pay rises, overtime, flextime etc look it up in the organisation's Award or Certified Agreement - it will be publicly available on the internet. The only time you should discuss things like this are if the selection panel raises it first. 29. Most government salaries fall within a range for each particular level. You can look up what salary range applies to your position in the organisation's Award or Certified Agreement, or it was probably in the job advertisement. Your actual starting salary within this range will depend upon the organisation. Again, check the Award or Certified Agreement because it might give clues as to what starting salaries usually are and what conditions need to be in place for you to start above the base of the salary range. For example, most government agencies expect new employees to start at the bottom of the salary range unless they can prove that they are worth more than the base. There are usually a few criteria for determining who can start above the base and why, and these could include previous relevant experience that would enable you to commence and be effective with minimal training, qualifications that would benefit the organisation and your worth in comparison to others performing similar roles. Your previous salary normally has no effect and will not be considered. Find out, before the interview, what these criteria are and write a short brief that will form your claims for starting above the base of the salary range. A few larger commonwealth agencies and some state departments often ask at the end of the interview if you have any claims for starting above the base of the salary range, and if you have your typed out justification ready to go, you might just score a few more thousand dollars a year. Now, is that worth preparing for? 30. Stay professional. The last, but not the least important tip for your government job interview. Some interviews are extremely formal and some interviews are very laid back and informal. Even if you think it's informal or the interviewer says it's informal ... it's not. Stay professional. A lot of applicants make this mistake and become too relaxed. This is an interview for a job - there's nothing informal about it! Good luck with your next interview. Like a good boy scout, be prepared, and like a movie star, give your best performance. Sign up to the free newsletter to receive information and advice for your next application and interview. This will also give you free access to our VIP section which contains free articles and application templates. 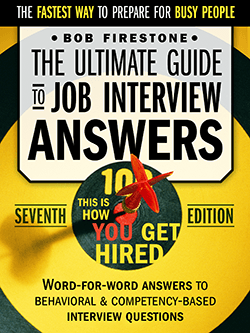 Use the guide "Get That Job! 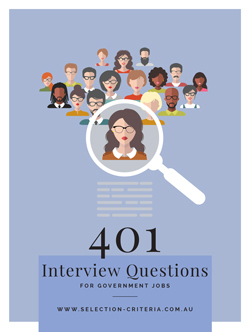 The Best Guide to Applying for a Government Job"
Use the quick guide "401 Interview Questions" to help you prepare for your next government interview. Read the main article about government interviews here.